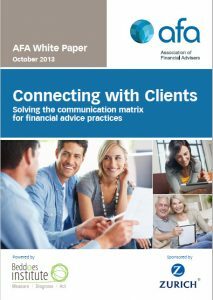 “Connecting with Clients – Solving the communication matrix for financial advisers” is the flagship white paper of the 2013 AFA National conference. This is the third in a series of white papers that use an evidence‑based approach to quantify the DNA of leading financial advice practices. The ‘Leading Practices’ white paper series began with “Pathways to Excellence” which was released in October 2012. That paper provided a clear pathway to becoming a leading advice practice by pinpointing the two areas that matter most to clients; 1) adviser qualities and 2) the practice service proposition. As an extension of the ‘Pathways to Excellence’ research, ‘The Trusted Adviser’ white paper released in April 2013 took a deep dive into the qualities of advisers that engender trust and build strong and enduring client relationships, namely strong interpersonal skills and high levels of emotional intelligence. ‘Connecting with Clients’ now provides financial advisers with evidence‑based guidelines for optimising their client service proposition by describing the communication needs of clients across different generations. This research shows how leading practices address the communication needs of their clients and quantifies the benefits of getting the communication mix right. Generational profiling of communication preferences was undertaken to understand the unique and specific needs of different generations. This approach has been widely used in marketing to create a clear picture of the typical characteristics of an individual within a particular generation for the purposes of tailoring offerings and messages. Secondly, they must tailor their communication strategy to suit the needs of the generation/s they are working with as each generation has unique and different preferences; and 3. Finally, they need to consider how many channels of communication they are using and how often they are connecting with their clients given the ‘more is more’ effect that has been identified in this white paper. The benefits of delivering in these three areas are clear: advisers who communicate using their clients’ favored channels achieve higher client satisfaction, have stronger client relationships and have clients that are more likely to recommend their practice.